by Mike Hall, AFL-CIO, Jun 19, 2009. An investigation by the Government Accountability Office (GAO) confirms what union and other workplace safety advocates have charged for years—the Bush administration’s reliance on voluntary policing by employers of their safety and health actions did not improve worker safety. By Laurie Johnson. Posted on the Natural Resources Defense Council's Switchboard blog. June 18, 2009. Over three decades of experience with environmental regulation show that investments in environmental protection, coupled with GDP growth, led to an increase in jobs that were orders of magnitude larger than any job losses caused by environmental requirements. The dire job loss predictions by industry simply never came to pass. Instead, tens of thousands of new jobs were created every year, much more than the job reductions per year that various government agencies and academic analyses found after the fact, in only a few sectors. We detail the data further below. Wind the tape back to before environmental regulations were passed, and we see that the opponents of the day, just like today's climate obstructionists, made dire job loss forecasts. They never came true. By Peter Dreier and Donald Cohen. Originally posted on Talking Points Memo. May 20, 2009. Sometimes business groups lie so blatantly that even their strongest allies in Congress have to call their bluff. By Peter Dreier and Donald Cohen. Posted on Huffington Post. May 11, 2009. In its first 100 days, the Obama administration did more to address global warming and the environmental crisis than the Bush administration did in eight years. By Peter Dreier and Donald Cohen. Posted on Talking Points Memo. April 29, 2009. Universal health care and the reform of outdated labor laws are shaping up to be the two great policy battles of the year, if not the century. Business interests are dusting off decades of campaign rhetoric warning about the doomsday scenarios if Congress enacts "socialized" health care and the Employee Free Choice Act to give workers a decent shot a organizing unions. They're wrong about both issues, but will politicians and pundits believe them anyway? 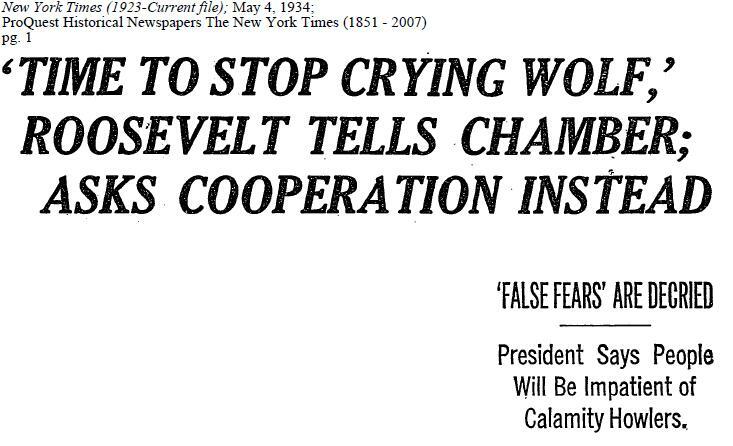 FDR to Chamber: "Stop Crying Wolf"